What Capability Features Do You Get With the Ram 1500? If you want a light-duty pickup truck, our team at Dunning Motor Sales suggests the Ram 1500. The Ram 1500 is a popular model with consumers because it comes loaded with a number of capability features that you can read about below. 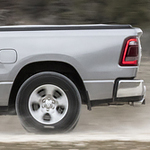 The standard engine that is included with the Ram 1500 is the 3.6L Pentastar V6 engine with eTorque. This engine can deliver 305 horsepower and 269 lb.-ft. of torque, and it can tow an impressive 7,730 pounds. The other engine in the lineup is the available 5.7L HEMI V8 engine that can deliver 395 horsepower and 410 lb.-ft. of torque. The 5.7L HEMI V8 engine with eTorque can tow up to 12,750 pounds, which is best-in-class V8 towing capability. You can also choose the available class-exclusive Active-Level Four Corner Air Suspension System with the 1500. This suspension system provides you with reduced drag and increased efficiency because it automatically lowers when you are traveling at highway speeds.